Keith Curle says Sam Hoskins’ reaction finally breaking his Sky Bet League Two scoring duck at Tranmere Rovers on Tuesday is a true measure of the ‘good character’ of the Cobblers striker. Without a league goal all season ahead of the trip to Prenton Park, Hoskins scored twice in the first half to secure a precious 2-1 win for the Cobblers, and in the process make his critics eat their words. The former Southampton has come in for some stick from the terraces as well as on social media for his lack of goals, but he came good on the Wirral with his match winning double. Many a player in such a situation would have made a point of venting his frustration in his celebrations and post-match interviews, but not Hoskins. 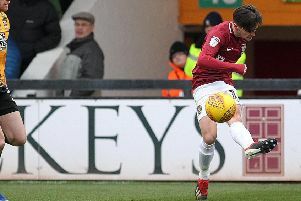 He was simply delighted to hit the target and help the Cobblers to a much-needed victory, and Curle says Hoskins’ reaction speaks volumes about the player and his attitude. “Hopefully people have taken on board Sam’s reaction after he scored those two goals,” said the Cobblers boss. “The lad has taken a little bit of stick because his scoring stats per minutes played haven’t been good, and he has taken criticism from certain sections. “But he didn’t score those goals and then want to ram it down everybody’s throat. “It was a case of him showing good character, and a good appreciation of the support that he has been getting from a large majority of people. “One thing that Sam Hoskins will give you is 100 per cent effort, commitment, work ethic, and work-rate. “He knows himself he hasn’t been hitting the back of the net as much as he should have done and needs to do, but he hasn’t changed his focus.